Round 3: The Defender King! I’m now back at work so my updates may be briefer than normal but I did manage to be at Olympia for the start of the round and took some photos. The light in the auditorium isn’t fantastic so my photos are a bit dark. I don’t know much about photography but my camera is half decent, it’s got a pretty awesome zoom. This is actually my second camera as I traded my first one while we were in South Africa earlier this year! 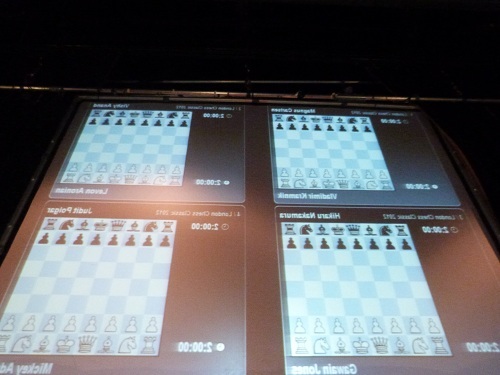 I managed to get behind the curtain in the auditorium and took a picture of the boards the players see. I’m not sure I could analyze the position like this but they do! 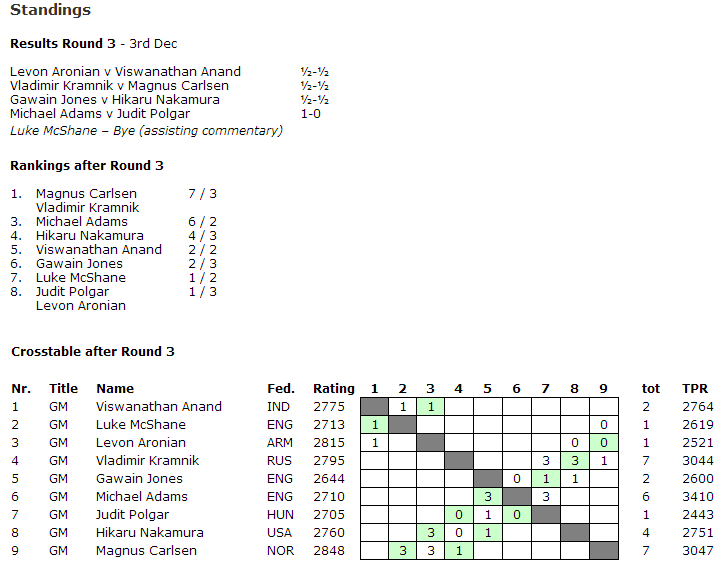 Yesterday, Gawain played the American Nakamura and that ended in a draw but my gosh it was a hard fought draw. So off I went to work and I was nervously watching the game still! I’m a part time nanny and occasionally teach my kid chess and we were looking at the position on the iPad, he understood it relatively well but as I was tidying up he said “Sue, look Gawain’s winning”, I rushed over, frantically analyzing the position noting that not much had change, it was still B+5 vs N+5, I asked him confused “Why is white winning? ?” and he replied confidently “He’s got more points, the bishop against the knight 3 against 2!”. Not bad, considering we haven’t look at chess since before the summer but I gently explained to him that it’s a bit more complicated than that. One thing, I am noticing more as I watched the players is how much they are thinking and concentrating. Some look away from the board staring in the space and others place their hands on their forehead and sink into deep thought and this is before the first move! I use to think, why would you do that as you are white and know what you are playing but there are so many lines and variations they are just going over it. Once they get into a rhythm they can play several moves in quick succession but there is no need to rush your moves out. Of course, some players are prone to time trouble but chess requires a lot of thought and preparation! After work I rushed off to play a home match for my club, Hammersmith CC. I hadn’t played for a few weeks so thought I’d get a game in as we are away over the Christmas/New Years period but it was probably a mistake as all I was doing was thinking of Ga’s endgame! I turned off my phone so didn’t know the result. I was quite fortunate my opponent offered me a draw when he was a lot better in some Scheveningen. I turned on my phone and called the team up to find they were in a pub about 5 minutes away! I love it when things are all so close by. Today, Ga faces world number 1 Magnus (Maggie?) 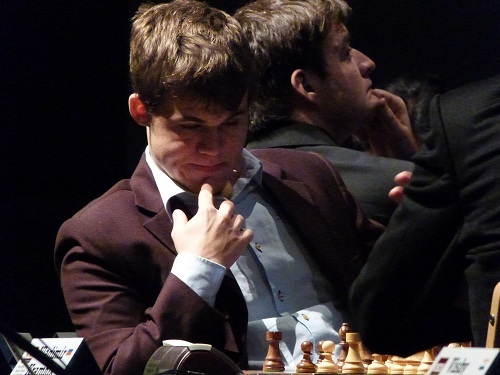 Carlsen. 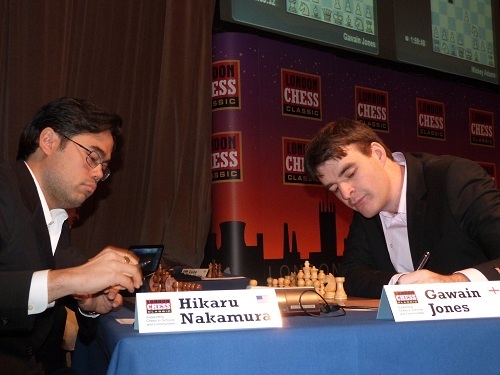 They have played before when Magnus was younger and Ga was an IM in Gaustal. Check out the game here as I’m not able to upload pgns. I won’t be able to make it to today’s game, as I’m off to work then mandarin class. Don’t forget it starts at 4:00PM local time instead of the normal 2:00pm.